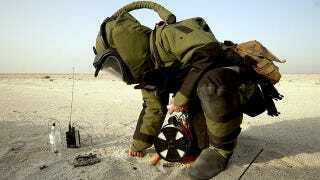 And in case you're wondering, the current world record for fastest mile in a bomb suit is nine minutes and 58 seconds. What Staff Sgt. Jeremy Herbert was doing running that far, who knows. The French are coming. And they can spot you from 150 meters. That's thanks to the Fantassin à Équipement et Liaisons Intégrés, a French infantry combat suit. It comes complete with an electronic jacket, osteophone-laden helmet and an assault rifle that doubles as a wireless video camera. Information from the multitude of sensors gets fed back to the soldier through an interface on the helmet, allowing them to see through obstacles or in the dark. Plus, the 24-kg suit is supposed to be quite comfortable – its fire-retardant fabric is designed for maximum ventilation. You'll never see that sniper in the grass. Designed to blend right into the foliage, ghillie (or yowie) suits come in all sorts of varieties, with burlap, twine, leaves, twigs and other bits and pieces of nature stuck right onto a poncho. Taken out of their natural habitat, though, they look downright ridiculous, like these particularly Chewbacca-esque camouflage outfits from Iran. Nett Warrior, if it ever materialized, is the Army's longstanding attempt to build an ensemble of wearable electronics. The idea is to connect soldiers on the battlefield with a variety of gadgets – mobile computers, maps and radios – so that they can communicate and navigate on the go. After twenty years of working on the outfit (and predecessors like Land Warrior, pictured above) the Army recently put the program on hold. Maybe it has something to do with the fact that smartphones can do everything the eight pound Nett Warrior could. Provided there are cell towers nearby, of course. This is one emperor with some interesting clothes. 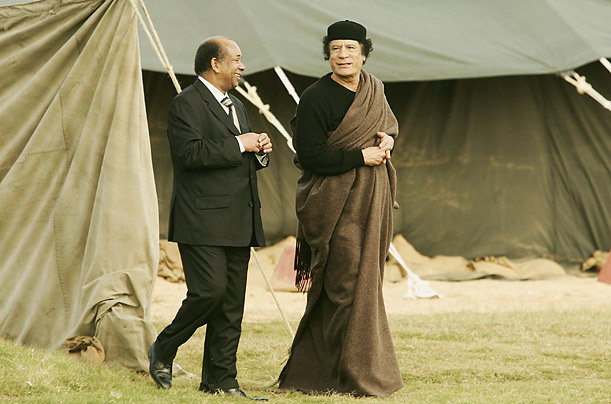 Muammar Gaddafi has appeared in everything from a brown sleeping bag to flamboyant purple robes, from ostentatious to just plain weird. These suits never get old. No, that's not a chef hat, shower cap or deflated balloon atop the heads of these Israeli soldiers. It's a called a mitznefet, the typical helmet cover of the Israeli defense forces since the 1990's (it's supposed to help with camouflage by disguising the recognizable shape of a helmet). The floppy headgear has roots in the ancient head coverings of the Jewish high priests. These futuristic silver suits are designed to withstand even the hottest of aircraft fires, and so are a staple for the defense industry. So-called proximity suits are made of aluminized glass fibre fabric, which reflects 90 percent of heat, and is an improvement over the older model, which was made of asbestos. They're tough. They're strong. And they're in pink. A 2009 parade celebrating the 60th anniversary of the founding of the People's Republic of China featured this miniskirted, knee-high-booted, insanely symmetrical procession of Chinese militiawomen.